Now that the overblown spectacle of the Super Bowl is over, I’d like to put the spotlight on the other end of the football spectrum. If you will indulge me, I’m going to highlight one of the greatest football coaches ever. Watching your home team win a championship is a luxury not every fan get to enjoy. I’ve had the pleasure 16 times – with my very own Ledgers! I’m a proud grad of St. Mary’s Springs Academy, in Fond du Lac, Wisconsin. We had 750 students in the early 60’s, but could barely field a football team because half of my male classmates had to be up by 5:30 to milk the cows. Those family-run dairy farms are now all but gone, and the school is down to fewer than 300 students. The football program, however, is thriving. Bob Hyland (no relation to the great Packers guard of the late 60’s) arrived to coach the team in 1971. He was fresh out of college, where in 1969 he was named Offensive Lineman of the Year for NCAA Division 2 champion North Dakota State Bisons. Hyland took over a dilapidated program and went 1-15-1 in his first two years. Then he started to get the hang of it. He instituted an intense weight-training program. “Our kids worked hard,” Hyland says of those early years. “They’ve always worked hard to be the best they could be.” It paid off. From 1975 through 1978, the Ledgers played in four consecutive championship games, though losing each time. It took the school until 1983 to capture its first title. They won it all again in 1984, and again in a shutout. The wins kept coming – and they keep coming. Hyland just finished his 48th season – winning another state title. He’s won 32 conference championships. He’s won it all five out of the last eight years, giving him 16 state titles overall. I believe the team is riding a 30-game win streak. Hyland’s record now stands at 467-105-2 – an 82% win rate. Coach Hyland is still getting better. Hyland is already the winningest high school coach in Wisconsin history. He intends to coach through the 2024 season, when his youngest grandson will be a senior at the school. He also has the seventh most wins in the nation’s history. He’ll be number three in US history after next season. This isn’t one of those urban prep school dynasties in which star athletes are recruited from a wide area. These are local kids, who seldom possess great physical talent. I’m not sure if they’ve ever had a player go on and make a name for himself at a Division 1 college. Most of the starters play on both offense and defense. What they do, however, is play nearly mistake-free football. There is the occasional fumble, but you’ll seldom see off-side, delay of game, roughing the passer, or face-mask penalty. You won’t see players confused over what the play is, or the defensive backs having broken coverages. They tackle properly and they run their plays precisely. These teenagers are extremely well prepared – they flat-out play much smarter and more disciplined than their professional counterparts. On most offensive plays, you’ll see two or three options – something I hope we’ll see the Packers doing in the upcoming season. Defenses never know what’s coming or who has the ball. Hyland is anything but “old school” when it comes to his play book. Fortunately, a couple days after the games, I’m able to watch a full video of about half of their contests. It’s a beautiful thing to watch when it’s done this well. Truth to tell, I’ve looked forward to Springs games more than to Packer games the last couple of years. They schedule the best teams they can find for non-conference games. They try to get all three-dozen or so players into the game. They’ll sometimes lose a game or two early in the season, but by tournament time – which is their focus every year – they are a finely-tuned machine. Good high school football is as pure as the sport gets. 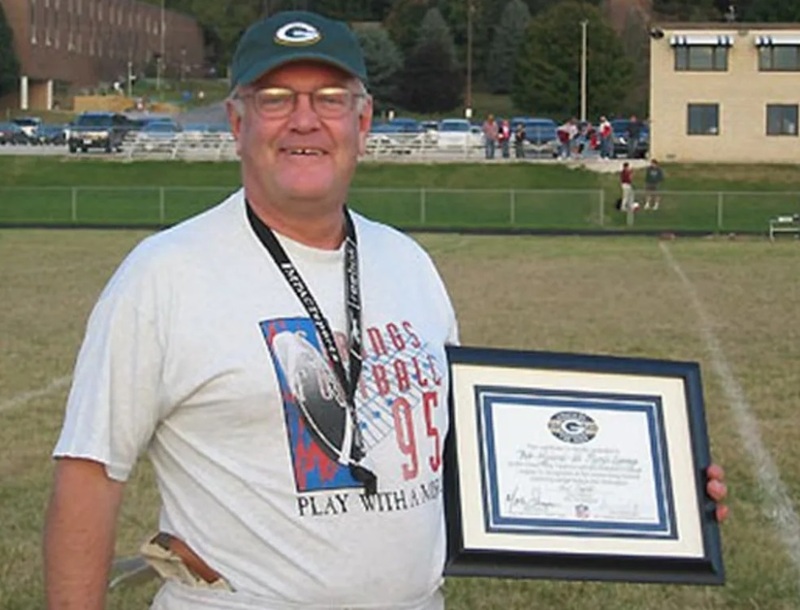 The photo shows Coach Hyland being honored by the Packers as “Coach of the Week.” Behind him, you can see the beginnings of the “ledge,” an escarpment that stretches to Niagara Falls. Many “springs” run through what was a 40-acre campus, a few miles out of town, when I was there. The Ledgers will have to retool considerably in 2019, as many seniors will have departed. I’ll wager, though, that Coach Hyland will again work his magic, as he does almost every year. He’ll adjust his offense to suit the abilities of the year’s roster. Bottom line: great coaches will find ways to win, despite the roster composition, regardless of injuries (within reason), and despite all manner of adversity. Never underestimate the role of the head coach in determining a team’s success or failure. Going back in time is sometimes priceless. Much like spending time getting reacquainted with a best friend from school that you haven’t seen for a long, long time. Good for the Soul. Rock on. In other news:….. There is a new story covering old news about Cole Madison, with a twinge of new news, I know that you are trying to guess what it is, and i’d guess half of you are guessing right. Great story Rob. I feel the same way about Joe Labuda. Sure enough, Berlin native Joe LaBuda at the end of 2017 had racked up a 288-53 record at Menominie High School – and was then ranked eighth winningest coach in the state – he had a stunning win percentage of .847 at that time. I also read that state law required him to retire in 2017 after 28 years, but then he could re-apply after 75 days, so maybe he’s still coaching. Pat Rice of Waunakee is 274-39, an .875 win percentage. Carl Tackes, Stratford High, retired with a 236-48 record, an .831 win percentage. He is indeed still the HC at Menomonie HS. You cant write the book about WI HS football without talking about Labuda’s 1990s Menomonie Indians teams. Hell of a program. One of the most corrupt HS football programs in the state of Wisconsin. Fond du Lac means “bottom of the lake” in French. You know what they find at the bottom of the lake? Muck and fish crap. Love the article…. And shout out to all the players the last 50 years who trained year round to the best they can be and learn from Coach Hyland! Go Ledgers.